This actually happened to me, in pretty much the same way. Someone who knew me when I was a child had no problem rewriting his memories in the blink of an eye to include a female version of my young self. And that makes me wonder, is our memory really that volatile, that easy to manipulate? 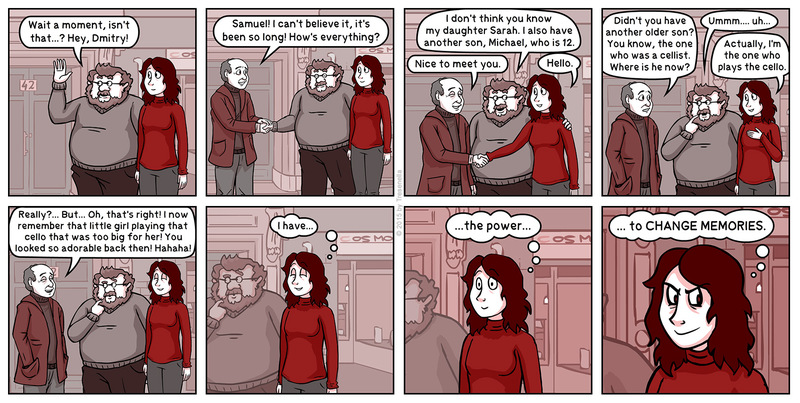 In any case, I hope Sarah doesn’t turn into a super-villain anytime soon (I had too much fun drawing that last panel). The power goes beyond the mere alteration of memories. You can give them thoughts and get them to do things. Be wary of great minds as true great minds are immune to our powers. Yeah, our memory IS that volatile. Any memory that doesn’t have EXTREME emotion connected to it is usually forgotten only to be “remembered” when we put together what we are currently seeing that is triggering the memory and the feelings that were attached to it. For example in this case, because no emotion was tied to the actual gender but rather the sight of a child too small playing the cello, his brain fills in that it was clearly a girl because that is what he sees in front of him. According to the scientist and doctor,the answer is a fXck big YES!!! (They asked some volunteers listen to an “something that they totally make up and surly havn’t been heard by those volunteers before” fake legend/saga/story of some monster(or scary man) around that area. Than after a while,they ask the volunteers about that “story”,and guess what? Those people haerd the “story” had already created a solid memories about heard the legend as a kid,and saw the so called “monster” before!!! You humans move your memories between long-term and short term archives instead of loading new instances. No redundancy, no back ups. Then they get moved back again after who knows what additional emotional baggage is added to them or definition was lost. Worse than that you automatically patch memories with others that contain similar meta data, no wonder corruption like this occurs. I am surprised more of your species don’t utilize this flaw to their own advantage. Wait, Sarah’s father is Tom Smith? Yes. We reconstruct memories. Even those with total recall do not remember everything. It’s the great illusion when someone asks do you remember X event. We reconstruct that event when we revisit it. Details will have changed and we won’t remember them all. You can then subtly influence the memory, “remember the last time he bumped into you. Yeah. He was wearing that blue shirt.” You remember being bumped into, but the shirt? Unlikely, so you add it to the reconstruction.